Ricky Stenhouse Jr. celebrates in Victory Lane after winning a NASCAR Cup auto race at Daytona International Speedway, in Daytona Beach, Fla. in 2017. Stenhouse Jr. is a two-time Xfinity Series champion and coming off the best season of his NASCAR career. He won his first two Cup races and made the playoffs for the first time in his five seasons. CHARLOTTE, N.C. (AP) — Ricky Stenhouse Jr. is a two-time Xfinity Series champion who is coming off the best season of his NASCAR career. He won his first two Cup races last year and made the playoffs for the first time in five seasons of racing in NASCAR’s big leagues. Building on that momentum will be his goal this year, and likely what he focuses on when he faces reporters during NASCAR’s annual preseason media tour. What Stenhouse probably won’t talk about is his breakup with Danica Patrick, though he will certainly be asked. Why should anyone ask Stenhouse about his ex-girlfriend? The circumstances are unique and unconventional. He and Patrick were professional athletes from the same sport who competed against each other weekly while living together as a couple both at home and at the race track. They dated for five years, the entire time Stenhouse has raced in the Cup Series, and being her boyfriend became part of his identity. So, yes, there is interest in hearing from Stenhouse about the split. She tearfully thanked Stenhouse, who watched from the back of the room, as she announced she’ll retire from racing after two events this year last November at Homestead-Miami Speedway. About two weeks later, the couple had split. Patrick said she is now dating Green Bay Packers quarterback Aaron Rodgers and has been the most relevant racer the entire offseason through a promotional blitz that has kept her in the headlines. Stenhouse, meanwhile, has said nothing. It’s the right course of action. Stenhouse started to flourish on the race track last season and, if he chooses, can be an important part of NASCAR’s future. His victories at Talladega and Daytona last year absolutely had a lot to do with the horsepower Doug Yates put in Stenhouse’s Ford at those tracks, but he still showed he has the ability to win. Stenhouse had done very little to shine on the race track prior to last season, but much of his Cup career has been spent with a rebuilding Roush Fenway Racing team. His numbers from last season are all career bests, and while they aren’t spectacular statistics, he still showed that RFR and the No. 17 team are making progress. The next steps will require Stenhouse to be a leader at Roush, with his race team and the organization. Stenhouse has an opportunity to become something much bigger than Patrick’s plus one. He was 25 when they began dating, didn’t go to college and most of his learning was done in race cars. Stenhouse is now 30 and has a chance to show the world who he is as a racer and a person. His passions are dirt racing, the golf league comprised of NASCAR personalities and Ole Miss football. When he’s not racing, he probably wants to be racing. This is now Stenhouse’s time. He gets to not only reset, but also rebuild who he wants to be in the world of NASCAR and with his race team. Those are the kind of things Stenhouse is likely going to focus on in the buildup to next month’s season-opening Daytona 500. He won at Daytona at July, so there’s no reason to think he won’t be a contender in the 500, and a victory there would be the biggest moment of his career. What Stenhouse has ahead of him is now what’s important. He alone gets to dictate what happens next. 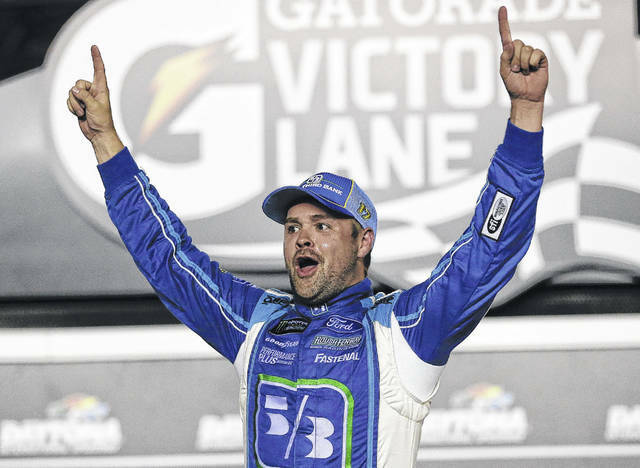 https://www.limaohio.com/wp-content/uploads/sites/54/2018/01/web1_Stenhouse.jpgRicky Stenhouse Jr. celebrates in Victory Lane after winning a NASCAR Cup auto race at Daytona International Speedway, in Daytona Beach, Fla. in 2017. Stenhouse Jr. is a two-time Xfinity Series champion and coming off the best season of his NASCAR career. He won his first two Cup races and made the playoffs for the first time in his five seasons.